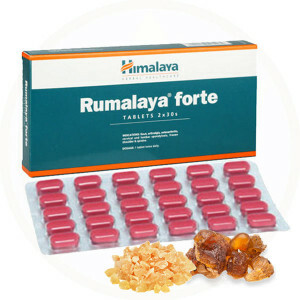 Rumalaya Forte is a safe, yet potent, botanical formulation that assists in the relief of joint and bone aches associated with various skeletal ailments. Its natural ingredients possess potent anti-inflammatory properties that help to alleviate pain. Boswellia (Shallaki) gum resin extract is effective in reducing joint swelling, pain, stiffness and other symptoms of inflammatory joint disorders including rheumatoid arthritis and osteoarthritis. Helps to improve the blood supply to the joints and restores the integrity of blood vessels destroyed by spasms. Boswellia significantly reduces the degradation of glycosaminoglycans, protects the joints and prevents cartilage damage. Take one tablet twice daily or as recommended by your health professional.